With his personal finances greatly improving and with the proceeds from the sale of four paintings in May, Childe Hassam was able to undertake his fourth trip to Europe in June 1910. Travelling with his wife, Maude, through England, the Netherlands, and Belgium, the Hassams reached Paris by the second week of July. The city, the artist wrote to his friend J. Alden Weir, was "a huge Coney Island-noisy, dirty." The Hassams settled into the Hôtel de l'Empire, a moderately-priced thirty-room hotel catering to an American clientele, which was situated at 7, rue Daunou in the fashionable district bounded by the Place Vendôme to the south and the Place de l'Opéra to the north. During this three-week stay in the city, Hassam painted at least three canvases: The French Breakfast; July Fourteenth, Rue Daunou (New York, Metropolitan Museum of Art); and At the Writing Desk (Private collection). In The French Breakfast, Maude is shown receiving the petit or premier déjeuner which is customarily served to the bedroom at 8 a.m. 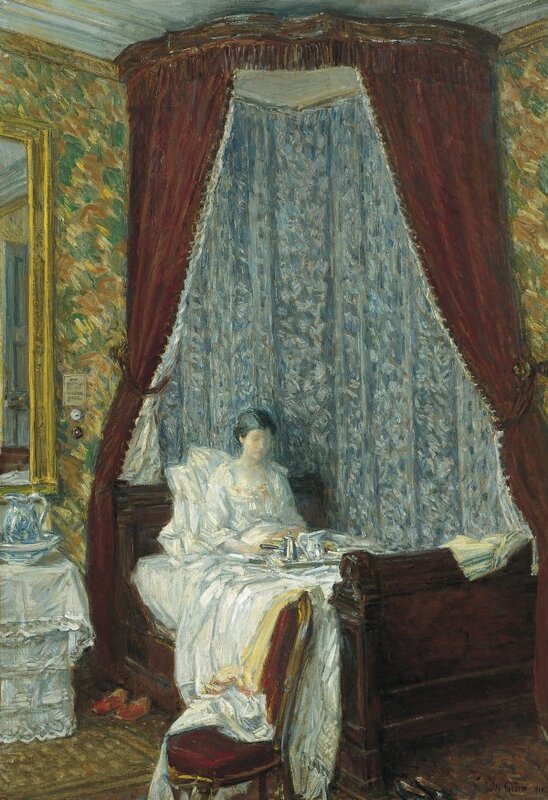 The blue-white patterns of the interior of the bed, the figure, and the serving set reflect some of the deeper red tones of the outer canopy which, in turn, contrast with the vivid green-orange agitated texture of the room's wallpaper. To the left, a mirror with a heavy gilded frame reflects the door on the opposite wall, showing that in reality the room is quite small. Bed-clothes are casually thrown over a chair in the foreground, while on the floor are displayed a vivid reddish-orange pair of slippers and a pair of black dress shoes. The languorous mood, as well as the heavily-textured pattern of the fabrics, has suggested to scholars the art of the French Rococo period and the richly-patterned paintings of Vuillard and Bonnard. Since Hassam's trip to Europe was "undertaken in order that he might again look upon the masterpieces of painting and form a definite opinion of these and of the progress of painting through all its periods, " it might not be amiss to suggest that Jan van Eyck's Wedding Portrait. Arnolfini and his Bride, 1434 (London, National Gallery), which Hassam would surely have seen the month before, also contributed to his conception of The French Breakfast. While Hassam's canvas, painted not long after their twenty-fifth wedding anniversary, lacks the solemn, dominant figures seen in the Wedding Portrait, both paintings share a severely restricted space with sharply receding floor and ceiling planes-a design unusual for Hassam. Each also shows a crimson-canopied bed, as well as mirror reflecting the opposite wall, but it is the emphatically placed slippers and shoes in Hassam's painting which seem almost to parody the empty red shoes and white wooden patterns of Jan van Eyck's masterpiece. Hassam's The French Breakfast relates to a number of other American Impressionist paintings portraying scenes of leisurely dining or sharing tea, including Mary Cassatt's A Cup of Tea, c. 1880 (Boston, MA, Museum of Fine Arts), Edmund C. Tarbell's The Breakfast Room, c. 1903 (Philadelphia, PA, The Pennsylvania Academy of the Fine Arts), and William McGregor Paxton's Tea Leaves, 1909 (New York, Metropolitan Museum of Art). Hassam himself, probably after leaving Paris for the Côte du Nord, painted The Terre-Cuite Tea Set, 1910 (Chattanooga, TN, Hunter Museum of Art) in which his theme of The French Breakfast is moved out-of-doors. This canvas may be the At Breakfast, Paris, which was exhibited in Boston in 1914, and the painting exhibited in 1916 in Rochester, Nueva York, and in 1917 in Chicago and St. Louis.